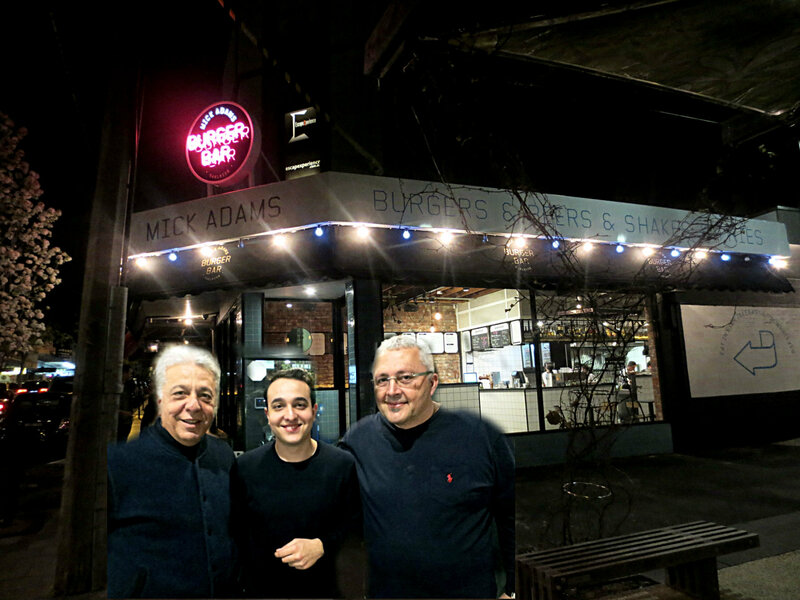 Owners (L to R) father and son Peter and Michael Koutroulis and Theo Raptis. Image superimposed onto background. 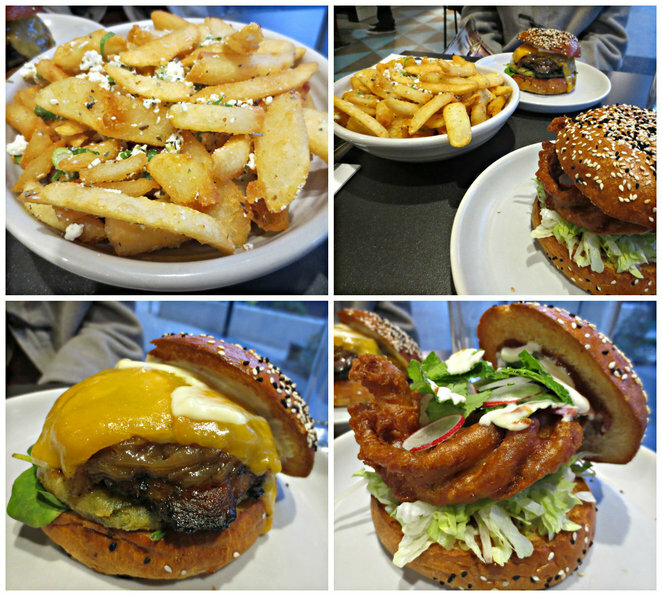 School holidays, time off, looking for something to do, I decided to head over to Oakleigh for dinner and to check out Mick Adams Burger Bar, which only opened a few months ago. The Atherton Road strip and Eaton Mall is one of my stomping grounds. From time to time I really enjoy browsing through the shops, the Salvos and the wool shop around there before heading for something to eat in Eaton Mall. Hence heading over there for dinner was no effort at all. Located on a corner just before Oakleigh Central and Woolworths, Mick Adams is at 38 Portman Street in Oakleigh and opens from 10am to 10pm daily. The venue was pleasing to the eye and upon entering there's an alcove to your left where there's seating, albeit not a huge space. I however opted to sit along the side that extends from the door to the back along the window, where there were 2 and 4 seater tables. It didn't look like a lot of seats but there could have been more in the room at the end. I didn't get a chance to have a look in as Mick Adams was entertaining bloggers for the evening as part of the promotion of the place I'm assuming. I have to say the wait staff were very friendly and helpful, which made the experience enjoyable. I also got lucky as the owners were there as you can see from the picture I managed to take. I had a quick chat to Michael Koutroulis whose father Peter popped in for a little while in time to pose for my picture along with Theo Raptis. Contrary to what you find on the internet that names Michael and Theo as the owners, Michael tells me there are three owners that includes his father. 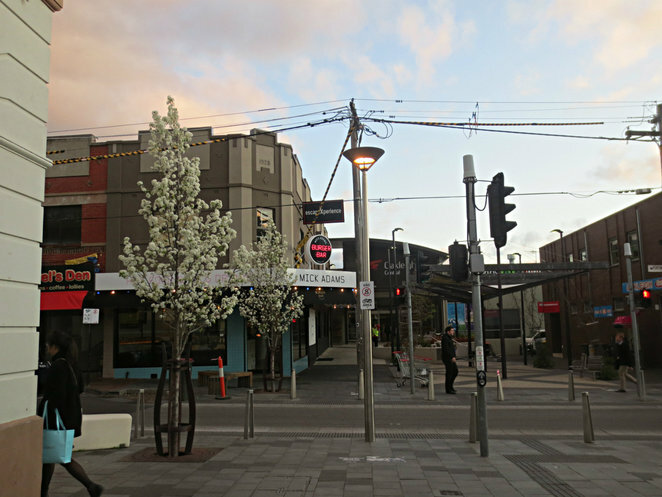 His family also owns Santoni Pizzeria Bar on Glenferrie Road in Hawthorn. 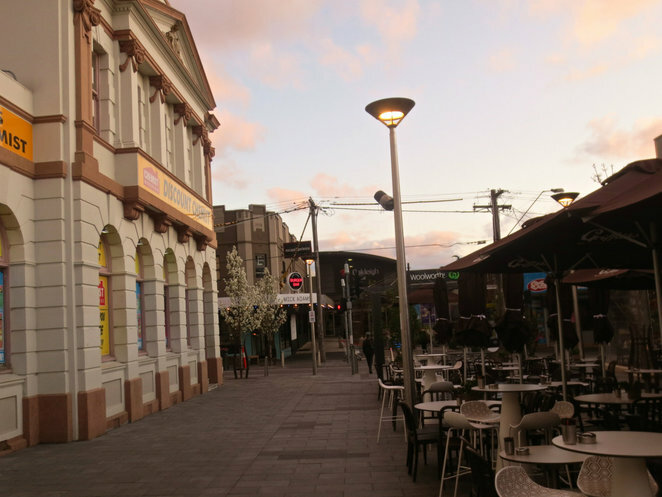 I asked, why a burger bar in Oakleigh, an area where there's a lot of Greek influence. The answer was simple. "How much souvlaki can one eat?" They just wanted something a little different and he credits the idea of coming up with the business to Theo who had always wanted to open an eatery. 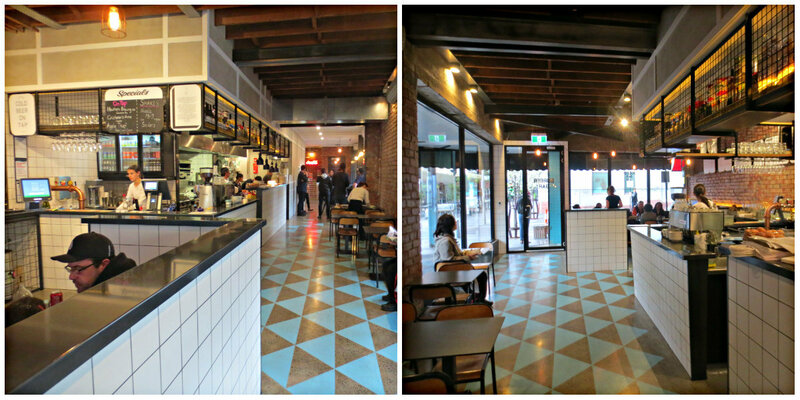 Wanting to focus on quality burgers and sides they've put a quality spin on a nostalgic favourite. The burgers feature locally sourced ingredients; the beef is minced on the premises as is the bread, freshly baked on site every day. Homage is paid to Joachim Tavlaridis who later came to be known as Mick Adams. Who is Joachim you say? He was of Greek origin and made history in Sydney when he brought back American know how to Australia by opening the very first Americanised milk bar called The Black & White 4D Milk Bar in 1932. It wasn't just an Australian first, but a first world wide. There were around 5000 customers who came in on opening day and in around five years, there were some 4000 milk bars throughout Australia, most of it Greek run. With burgers ranging from $9 to $16 and names like Dirty Dion, Cheesy Mike, Petey Sweetie, Naughty Nick, Anthony the Greek and so on, I settled on the Lean Green which was a chickpea fritta with grilled mushroom, red cheddar, spinach, caramelised onion and tomato relish. I also got the Cheeky Charlie which was a soft shell crab burger with coriander, pickled cucumber, radish, spanish onion, chilli jam, ice berg lettuce and aioli. It was a no brainer to get the Snickers shake and the feta chips at $10 was recommended to me when I asked which to choose. Beer battered chips, truffle parmesan chips, chilli cheese fries or polenta fingers were just one too many options for me. Ranging around the $10 mark, the bowl of chips is generous enough to feed two people comfortably. For me it was too much even though I shared it with my daughter, but we couldn't stop eating it as the feta chips were delicious with the slightly salty feta running through it. Having polished off the bowl, we ended up having only half a burger each and had the other two halves of each burger packed up to take home. The snickers shake was as you'd expect a shake to be without being overly 'Snickers bar' like which would have made it too sweet for me. The buns were slightly sweet, but I did love it that way and it was delicious and fresh. 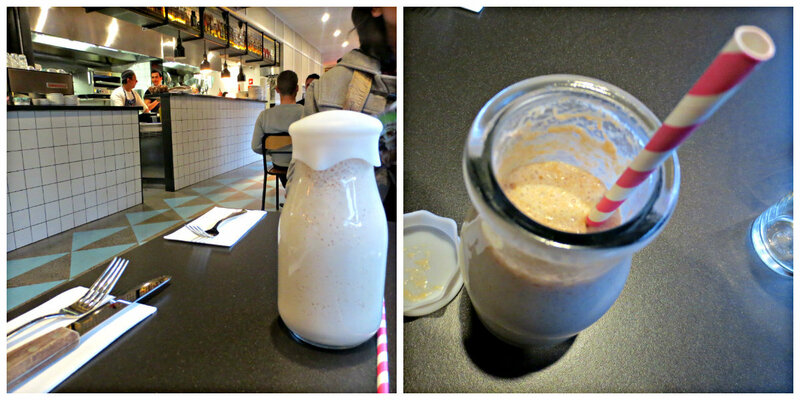 The relish and aioli running through the burger and its fillings were perfect and tasty. The soft shell crab was a hit, however, the batter seems to cling to the legs more. This gives you a good crab flavour through the body, but by the time you get to the legs, you're basically eating batter. I have no doubt there are those that enjoy the crunch of the batter in the burger but for me personally, I would have preferred the batter to be lighter so I could taste the crab more. Something like a light and crispy Japanese tempura batter, but that's personal choice. If I'm having an American burger in an Australian shop in a Greek influenced quarter, I have no doubt a little Japanese influence thrown in could only add to what will essentially be a multicultural meal. Biting into the Lean Green, the bun, fillings and relish was delicious but I found the chickpea fritta rather dry and it stuck to my palate every now and again as I chowed down on it. The patty was dense and solidly packed, and that's probably why it tasted dry and very 'chick pea'. Perhaps a lighter plumped up patty with other fillers in it would have been more to my taste. Would I go back to Mick Adams? Yes of course I would. I still have a few more burgers to try out, but I can't promise I could go beyond the feta chips to try the other options in the 'fries' section as it was just too delicious and I'm salivating just thinking about it. Why? An upmarket burger bar.